Victoria, British Columbia, the Capital city – for visitors, there are lots of great things to see and do. But did you also know it’s the capital city for technology and social media? It was big news when the technology industry eclipsed tourism in 2007. But what about social media? Well, the industry here might not be colossal, but it’s growing, and there is plenty of expertise for a small city, not to mention the power users. Victoria was the first city in Canada to form a Social Media Club chapter. Victoria is hosting the first Social Media Camp in Canada on October 3rd, 2010. Twestival Victoria raised the second most funds in Canada (after Toronto), and was the 15th most successful city in the world! Victoria is home to Flock, the social browser. 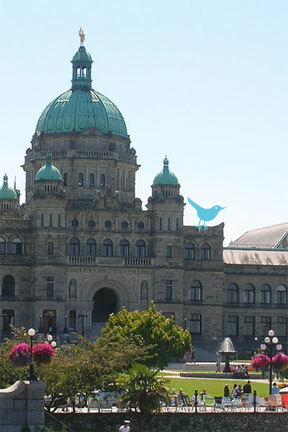 And now, Victoria is the first city in the world to proclaim June 30th Social Media Day! WHEREAS June 30th is being celebrated in over 400 cities around the world as Social Media Day. NOW, THEREFORE I do hereby proclaim the day of June 30, 2010 as “SOCIAL MEDIA DAY” in the CITY OF VICTORIA, CAPITAL CITY of the PROVINCE of BRITISH COLUMBIA. IN WITNESS WHEREOF, I hereunto set my hand this 24th day of June, Two Thousand and Ten. I picked up the official City of Victoria proclamation today, and will bring it to the party on Social Media Day, June 30th. The historic Fairmont Empress hotel, which uses social media regularly and effectively, was quick to pick up on the event, offering their luxurious Bengal Lounge for the party. A special thanks goes out to the Victoria City Councilor Chris Coleman, and the City staff who worked on finalizing the proclamation. Mr. Coleman was very enthusiastic when I suggested the idea, and saw the process through to the end.